Currently, 48 million Americans report some degree of hearing loss. One in three developed their hearing loss as a result of exposure to excessive noise levels. Inside our inner ears are thousands of delicate hair cells. When exposed to excessive noise levels too often or for too long in duration, these hairs cells become damaged or die. Damage to these cells is permanent and leads to hearing loss. Noise-induced hearing loss typically occurs slowly over many years. 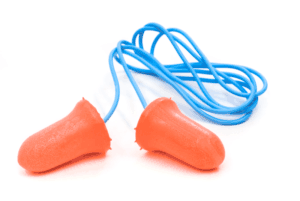 Earplugs: This type of hearing protection is made from foam or silicone. 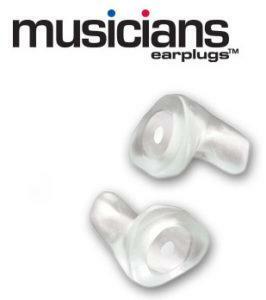 Earplugs come in a variety of sizes and are inserted directly into the ear canal. 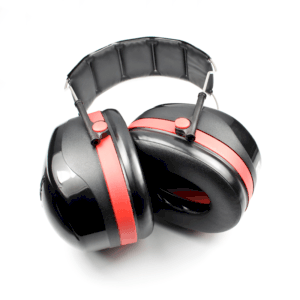 Earmuffs: This type of hearing protection is placed over the entire outer ear. Custom Hearing protection: This type of hearing protection is available in our office and requires an impression of your outer ear. Custom hearing protection is preferred by musicians because it maintains a high fidelity while reducing sound levels evenly. 2. Turn It Down: When using portable audio players, it is suggested that you “listen to music at 60% of the maximum volume for no more than 60 minutes a day.” Additionally, regulate the volume on your television, radio and car stereos. 3. Walk Away: If you do not have hearing protection and are unable to regulate the noise level, simply move away from the sound source. The decibel level of a sound will decrease by 6 dB every time you double the distance from the sound.